A Florida man who was allegedly high on ecstasy got stuck in a fountain after stealing a swan boat and paddling it out to the middle of an Orlando lake. 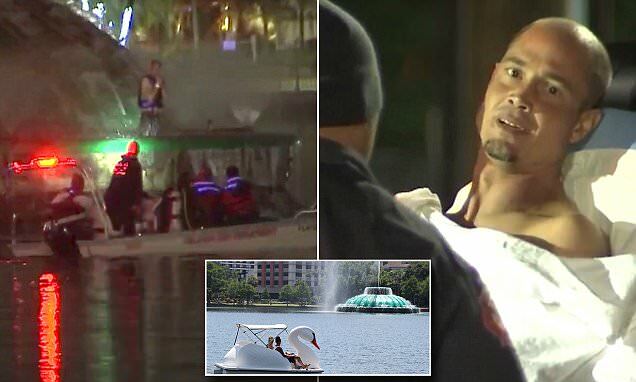 Keith Thurston, 36, of Orlando, Florida, was rescued from the middle of Lake Eola at about 4am on Friday, when he was heard shouting for help while sitting in the middle of the lake's decorative fountain. Thurston told authorities that he had taken the swan-shaped paddle boat onto the lake to commune with the swans 'because they didn't judge him,' according to the police report obtained by Orlando Weekly. The police report also stated that Thurston said that he had 'ingested a large quantity of Molly (MDMA)' prior to his swan lake escapade.